Location: To the west of the crossroads in Groeslon village on the south side of Lon Cefn Glyn. Present state: Demolished but sections of the down platform survive at the south end of the station site. 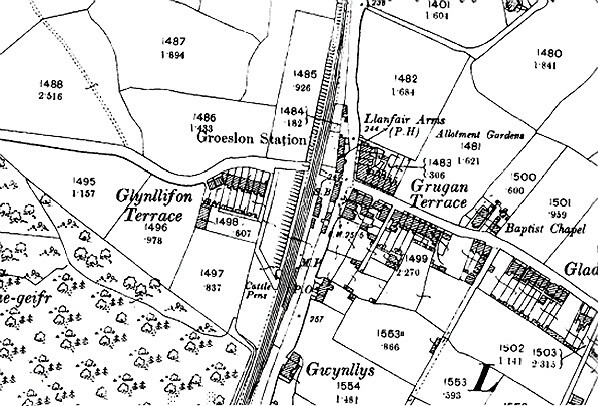 Notes: Groeslon was situated on the Menai Bridge – Afon Wen line which opened in stages between 1852 and 1871. It was in the centre of the village from which it took its name. The section of line through Groeslon was originally part of the Nantlle Railway, a horse-drawn tramway opened in 1827 linking quarries at Nantlle with Caernarfon’s quayside. Passenger services were operated between 11 August 1856 and 12 June 1865, and one of the stations on the line was at Groeslon. Facilities - if there were any - would have been basic. On 29 July 1862 the Carnarvonshire Railway (CR) was authorised to build a line between Caernarfon and Afon Wen. 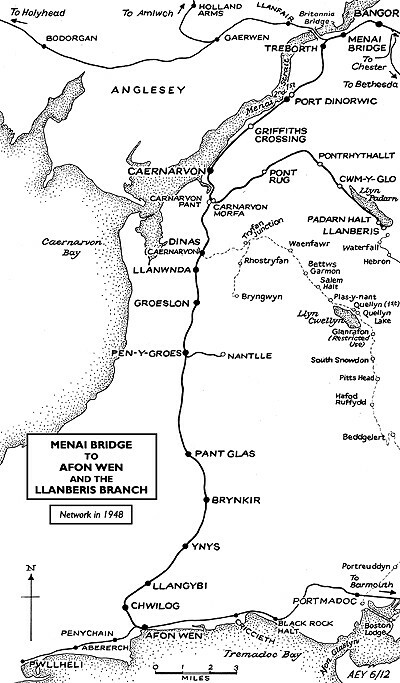 The CR took over the Nantlle Railway to facilitate the building of its line but, unlike at Groeslon, in many places a different alignment was constructed. In October 1866 the largely completed CR was inspected, but its opening was not approved until 2 September 1867 by which time all work was finished. Groeslon opened on 2 September 1867. The line was a single-track railway, and at first there was no passing loop at Groeslon. The platform was located on the east side of the line, south of a level crossing. A single-storey red brick building faced with yellow brick beneath a pitched slate roof was located towards the northern end of the platform. South of the station, east of the line, were a goods siding and small yard. Western Railway took over the CR. 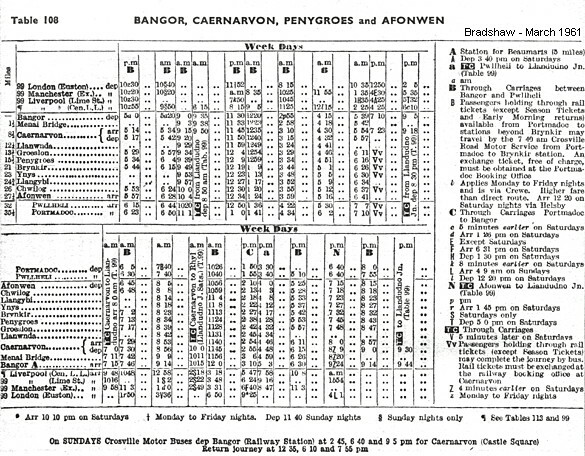 Following the opening of the Carnarvon Town line in July 1869, through passenger services between Bangor and Afon Wen began in January 1871. By 1895 Groeslon had six northbound and six southbound Monday-to-Friday trains with extra services on Saturdays, as shown in the table below. There was still only one train in each direction on Sundays. In 1911 a passing loop was installed at Groeslon, and an extra platform was provided. The new platform became the up (Menai Bridge direction) and the original platform became the down (Afon Wen direction). Traffic movements over the loop and the level crossing were controlled by a ground frame at the northern end of the down platform. A timber waiting shelter was provided for passengers on the up platform. By 1922 there were nine up and eight down trains Monday to Saturday as shown in the table below. There were no Sunday trains. On 1 January 1923 Groeslon became part of the London Midland & Scottish Railway (LMS). By summer 1928 the LMS was running eleven northbound and ten southbound trains from Groeslon on Monday-to-Friday with a couple of extra services on Saturdays. There were no Sunday trains. The frequency remained the same in April 1932. At the outbreak of the Second World War an emergency timetable was introduced on 11 September 1939, and Groeslon had only three trains in each direction on Monday-to-Saturday. The service was improved from 1 January 1940 when six trains ran in each direction on Monday-to-Saturday. the station closed. In summer 1948 there were only nine northbound and eight southbound Monday-to-Friday trains with retimed workings and an additional train in each direction on Saturdays. No Sunday trains ran. From summer 1947 and throughout the 1950s the line through Groeslon was very busy in the summer, as many specials were run to the Butlin’s Holiday Camp which opened for business that year. Not all of these trains, however, stopped at Groeslon. In the winter months the line was generally quiet although Groeslon remained one of the busier stations. In winter1956/7 Groeslon had nine trains in each direction on Monday-to-Saturday, as shown in the table below. Although winter was the quieter period, the winter 1956/7 timetable was as busy as the summer 1948 had been. m including that at Groeslon, had to hold a train throughout the day making it a very busy period for the railway staff. By the winter of 1959 nearly all of the passenger trains from Groeslon were DMUs, but from the start of the summer 1960 timetable steam became dominant, there being only one DMU service in each direction. Despite the busy summers on the line the Reshaping of British Railways report in 1963 (the ‘Beeching Report’) recommended complete closure of the line between Caernarfon and Afon Wen. Groeslon closed to goods on 4 May 1964, and to passengers when the line closed completely on 7 December 1964. The Caernarfon - Afon Wen line was not lifted immediately, surviving for a few years after closure. 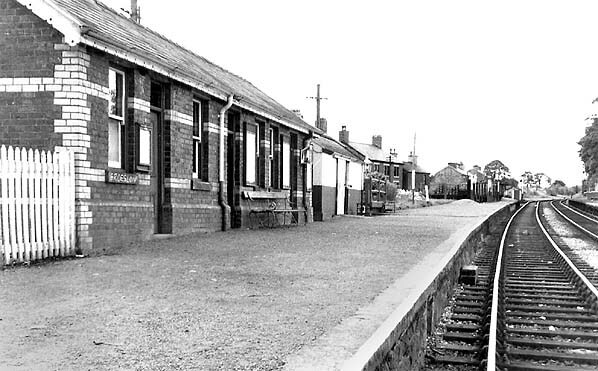 The station itself survived more-or-less intact until the mid 1970s. 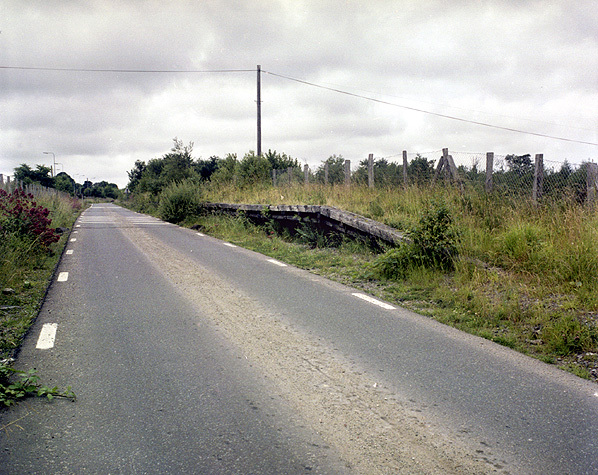 In 1975 a haulage road was laid along the trackbed between Llanwnda and Pant Glas by the MacAlpine company to be used by lorries carrying stone. By 2000 a cycleway and footpath had replaced the haulage road, and a car park was created at the site of Groeslon station. Groeslon station seen from the up (Menai Bridge direction) platform in 1911. 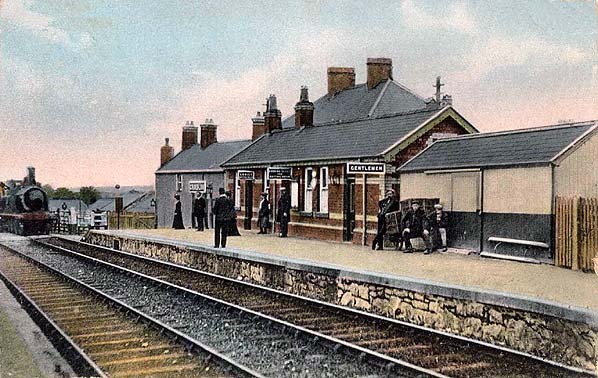 Groeslon was one of the busier stations between Caernarfon and Afon Wen as it was located in the centre of the village. 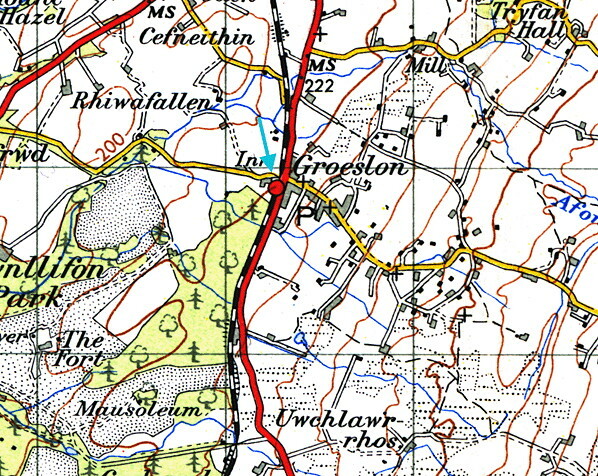 Groeslon station seen on a 1900 map. 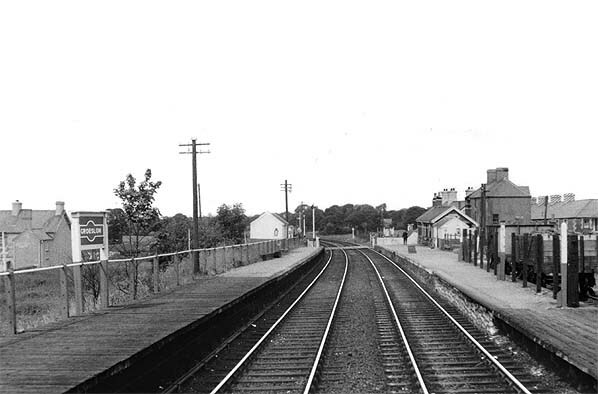 Looking north at Groeslon station in 1956. As can be seen from the picture, timber extensions were added to the platforms at the southern end of the station. To the right, behind the down platform (Afon Wen direction), wagons are visible in the goods siding. Photo by J L Smith from the John Mann collection. The down platform (Afon Wen direction) at Groeslon, seen from a northbound train in summer 1963. 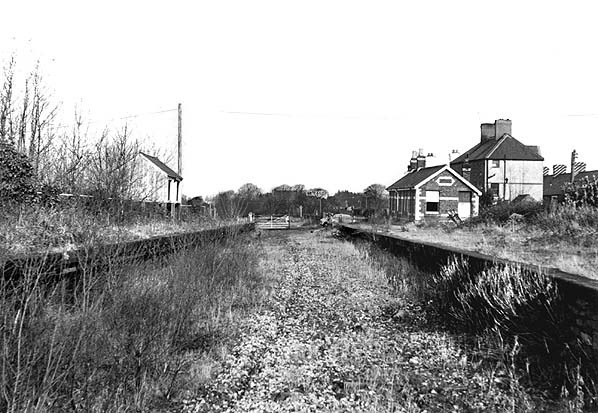 Groeslon station looking north in December 1972. Looking south towards Groeslon station in the 1970s. 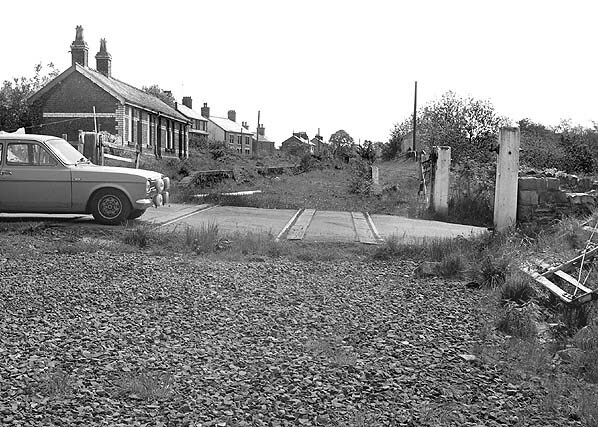 Track was in situ at the level crossing, and the station building was still standing. 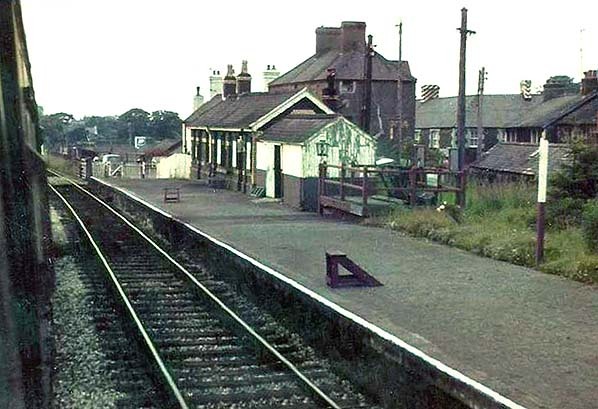 The north end of the Groeslon station up platform seen in May 1979. Looking north at the site of Groeslon station on 25 May 2012.